Something Delightful : White Lace & Turquoise + A HUGE Sale! White Lace & Turquoise + A HUGE Sale! Happy Wednesday! Today's post is featuring one of my all time favorite outfits, along with the details on a HUGE sale event! Scroll down to find out the details on the sale + see my favorite sale picks (there's some amazing things on sale!). But first off I have to spill the details on this gorgeous white lace peplum. Can y'all believe it is under $60?! I absolutely love how feminine and gorgeous it is. You simply can't go wrong with white lace. I chose to wear a white bandeau underneath for added coverage, but it can easily be worn with a white cami underneath for total coverage. It's one of those tops that can be paired with so much! I also see it being a great top to go with countless pairs of shorts. I added one of my favorite accessories to the mix...this statement necklace. It's under $40 and such a great statement piece. So here are the details: The sale runs from today through April 14th. 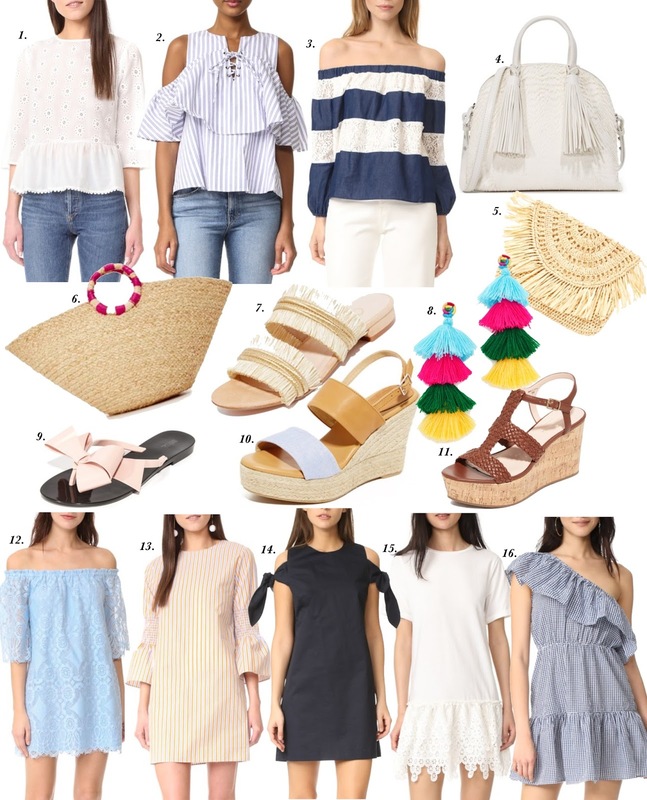 Hurry hurry if you've been eyeing a certain item you want, because sizes are selling out fast as this will most likely bee the last "big" Shopbop sale of the season. Enter the code EVENT17 at checkout to save 20% off of orders under $500 and 25% off of purchases over $500. So as I said before, you save no matter what you spend! I'm listing a few of my favorites below, and a list below that of some staples in my closet that y'all have seen me wear on here recently that are all on sale. I'll share an update of what I purchased as soon as I shop the sale! What's your favorite? *Shopping update: There are sooo many cute things! As promised, here are the things I grabbed up in the sale. These brown + Chambray wedges (OBSESSED! ), this gingham dress, this navy dress, this top and this tee shirt dress (just like the shirt version I have been loving since last year). This is one of my favorite combos - I love that top! This top is so cute and I love love love your necklace! This lace top is so pretty and I love your necklace!